Please join us for the conference dinner, which will be held at "Moritzbastei", one of Leipzig's most popular restaurants. 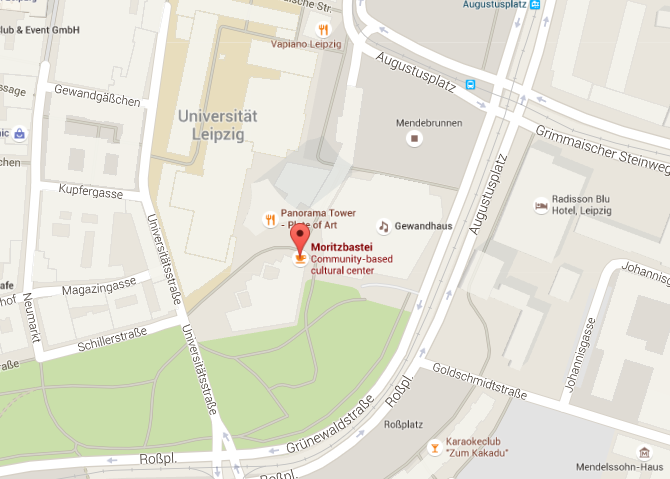 Moritzbastei is located right next to Campus Augustusplatz (University of Leipzig). Since the 70’s Moritzbastei has been one of Leipzig’s most famous student clubs, also featuring a theatre and concert location with an excellent restaurant. The historical vaults of Moritzbastei with their singular atmosphere are superbly suited for a Conference Dinner. The kitchen offers delicacies for a variety of tastes. In 2015, The Guardian called Moritzbastei a culture centre that visitors should check out. If you would like to order a vegan meal, please check the box “I want to have a vegan meal.” at your Registration.